Heart : TheyWilllRockYou.com – For the love of music! Serving Boston and Greater New England. In case you missed our review of Heart’s performance check it out here. And as if our praise wasn’t enough, it was recently announced that Ann & Nancy Wilson are among the 2012 honorees who will receive a star on the Hollywood Walk of Fame. Rock on ladies! Rock on! Check out our gallery of photos from their recent show below. Def Leppard have announced a US with a summer tour kicking off on June 15 in West Palm Beach, Florida. Joining them on the tour will be Heart. Tickets for the Live Nation produced tour will go on sale on beginning March 4th at Ticketmaster.com and LiveNation.com. Additional dates to be announced soon. Check out the full listing of announced dates below. Citi® cardmembers will also have access to presale tickets in select cities through Citi’s Private Pass® Program. For complete presale details visit http://www.citiprivatepass.com/. The band has partnered with I Love All Access to provide a variety of VIP ticket packages for the show, including premium seats, pre-show parties and more. Some say that music is the real fountain of youth. The packed crowd that made the trek to catch Journey, Heart and Cheap Trick at the Comcast Center in Mansfield, MA must be true believers. To find out that three of the most influential rock bands from our generation would be touring together on one bill was like opening up a candy bar and finding Willy Wonka’s golden ticket, A true world of pure imagination where everyone was a winner. Opening the show but far from an opening act was Cheap Trick. Cheap Trick has been together since the first year of my existence, for those of you keeping track, that’s over 30 years. For a band to sustain that long is impressive, for a band to be around that long and to still rock the house, is just plain amazing, but that’s exactly what Cheap Trick did. Playing their hits from the past four generations their set was outstanding from start to finish. Guitarist Rick Nielson made the most of their short set and played as many guitars as one man possibly could while Robin Zander took off his cowboy hat only long enough to blow out the finishing notes of their hugely successful ballad “The Flame”. All four band members seemed to be enjoying themselves onstage and at this point they pretty much own it so why shouldn’t they be having a blast. The only disappointing factor was that they didn’t get to play long enough. Next on the agenda was Heart. The sisters Wilson never disappoint and tonight was no different. Ann Wilson still has one of the most amazing voices in rock and roll, it’s timeless. The band worked their way through a star-studded set list from Barracuda to Crazy on You to Magic Man and threw in a cover of Led Zeppelin’s Going to California. Ann and Nancy Wilson will forever be praised for paving the way for women in rock and roll and after all these years they could still battle with the best of them, true legends. For most of the crowd, the night belonged to Journey. Journey has become one of those bands whose songs have become part of our livelihood, living on in pop culture all around us, and constantly taking us back to those places in our past with the sound of one note. For a band that boasts such prolific vocals, one would think that a constant rotation of lead singers would hurt their fanbase, but such is not the case. Journey has the innate ability of finding amazing frontmen in the most unique ways, the latest being no exception to the rule. 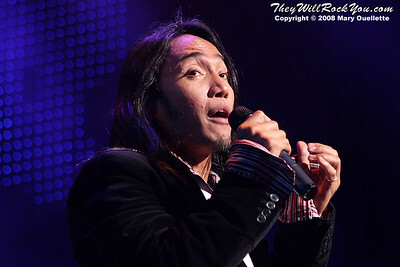 Arnel Pineda was found on YouTube of all places, bellowing his favorite Journey songs for all the world to see as part of a Journey tribute band, and see they did. When the members of Journey found themselves looking for a worthy spokesperson yet again, Pineda seemed to be the perfect fit. The fans agree. Screaming fans were knocking each other down for a chance to high five the Filipino ball of fire when he made his introduction to the stage. He engaged the crowd like a pro making eye contact, slapping hands and even serenading a lady or two, all that practicing in the mirror sure paid off tenfold. Pineda has definitely done his share of studying the moves, mannerisms, and sound of former front man Steve Perry. He hit all the notes with ease which is no easy feat, especially when you’re jumping off of drum risers. The only thing bigger than his voice was his level of energy, racing from one side of the stage to the other and spinning and jumping all the way. The fans were loving it and had definitely not stopped believin’. For someone who had to fill such large shoes, Pineda performed seamlessly and seemed to be enjoying himself almost as much as those in the audience. 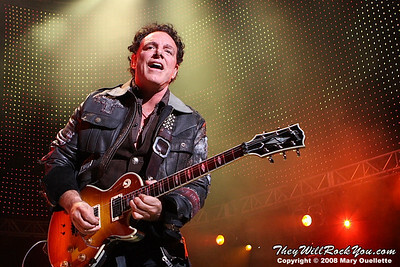 Backing up Pineda and the foundation of the band were founding guitarist Neal Schon, Ross Valory on bass, Jonathan Cain on keys and Deen Castronovo bashing the skins. Neal Schon and his patented guitar solo grimace were tack sharp and Jonathan Cain looked ageless at the piano. Valory and Castonovo were nothing but smiles proving that this band is still having fun after all these years. The band played a healthy mix of old hits (Separate Ways, Open Arms, Send Her My Love, Don’t Stop Believin) mixed with a few new songs (Never Walk Away, After All These Years) from their latest studio album Revelation, their first with Pineda at the helm, released in June of this year. Often times at concerts for bands who have been rocking the house for years and years the fans seem to wane during newer material, such was not the case. The crowd loved the new songs as much as the old, which had to be rewarding for Pineda. There are few guarantees in life but I think one thing we can all agree on is that Journey is one of those bands that has a song for each and every one of us, so roll down your windows, turn it up, and sing as loud as you can – you never know who may be listening.